Sedona, Ariz. (PRESS RELEASE) – If you want to make your backyard a hotspot for entertaining this summer, one Arizona grill master is making it easy by offering tips and techniques for the at-home chef as well as fresh ideas for unlikely and unexpected foods to grill. Leave the hamburgers and hotdogs on the backburner, says notable Chef Lisa Dahl who has earned her spot as one of the country’s top female chefs and restaurateurs. With some major grilling competition wins under her belt and national TV appearances, most recently grilling against the likes of Bobby Flay, Dahl is all about fresh ingredients that are simply prepared and pack powerful flavor, especially when grilled. Fresh seafood and local fruits and vegetables are all you need to elevate your grilling game and transform your backyard barbeque into a culinary fête, all with easy-to-follow recipes that can be quickly prepared and thrown right on the flame, no matter your skill level. Grilled Ambrosial Bundles: Meaning “refined” in Italian, Dahl’s typical bundles are exactly that with fontina-filled ambrosial grilled prosciutto-wrapped radicchio. Though, she’s got a slight twist for summer. “My summer version of this dish is my favorite. We start by taking a paring knife and cutting the core out of the radicchio to discard. Gently unpeel the outer leaves to separate without tearing. Lay the leaves open on a clean work surface and spread a generous dollop of fig jam to cover the inside cavity. Delicately mound a nice heaping of grated fontina cheese. Lay the sliced meat on work surface and place the radicchio on top. Fold the outer edges of radicchio to contain the filling inside like a cigar shape and gently wrap the Serrano ham neatly around the bundle and refrigerate to set. When ready to grill, lightly spray the bundles with EVO cooking spray. Place the lightly chilled radicchio bundles on grates of the grill until they’re nice and charred on one side. With tongs, carefully turn to roast all sides. When the ham is sizzling and the cheese filling is molten, transfer to your desired plate.” Finish the dish with a drizzle of balsamic reduction. If you’re throwing a party, you can also hold these in the oven at 200 degrees for 30 minutes before you serve. Grilled Loco Elote: Grilled corn-on-the-cob is a summer staple, but Chef Dahl is the queen of Loco Elote, which is her version of Mexican grilled corn. “You’ll start mixing a paste of mayo, lemon, garlic cayenne and one tablespoon of cheese in a small bowl. Place the corn on a shallow plate and slather the paste generously over the entire ear’s surface. Reserve enough cheese and all of the cilantro for the topping. Make sure that the grill rack is clean and the coals are hot with the flame tempered. Place the corn on the grill and leave in place until the initial side is nice and well-marked before turning. Continue rolling the surface of the corn until all sides are uniformly charred and browned. Carefully remove the corn from the grill and generously sprinkle with grated cheese and freshly chopped cilantro.” With this transformed version of Elote, you’ll have a standout appetizer side dish at your next pool party. Grilled Frutti Di Mare: A popular Italian dish meaning “Fruit of the Sea,” Frutti Di Mare is usually made with the freshest of seafood and served over pasta. Dahl’s version is campfire, gone gourmet. “My favorite thing about this dish is that the most difficult part is going to the grocery store. On a flat work surface, start by layering two 12-inch x 12-inch pieces of heavy-duty foil. Cut the fish into two-inch chunks, lightly salt and pepper. Next, throw in scallops and prawns and spoon a dollop of herbed garlic butter. Toss tomato pieces in a small bowl with a sprinkle of salt, pepper, oregano, a pinch of Chile flakes and EVO and toss them in the foil along with the capers lemon zest, coarsely chopped parsley, thyme and lemon slices. Splash a couple of tablespoons of white wine and tent the foil.” Grill the bundle on a hot flame for 15 to 20 minutes, carefully checking the foil to ensure the seafood is not overdone. The mix of juices and herbs season the seafood beautifully and it all comes together with a bouillabaisse-like consistency, instead of a creamy sauce as it’s traditionally made. Pair with crusty ciabatta bread and the rest of your Sauvignon Blanc and you’re ready to rock. Glorioso Peach Sundae: Instead of using apples and cinnamon for her Brown Betty, Dahl makes peaches and Amaretto cookies the star. “This recipe is one of my favorites as peaches are at the height of season. When picking peaches, you want to make sure they are firm and fragrant without being overly ripe. Cut the peaches into six slices and lightly spray them with EVO to prevent sticking. The key to this dish is having a grill surface that is nice and hot without scorching the peaches, so you want to cook over a medium flame to get a nice marking. With tongs, carefully flip until the peaches are soft with grill marks.” To finish the dessert, scoop one or two scoops of your favorite vanilla-bean gelato into the center of a bowl. Arrange the peaches in a sunflower shape around the mound. 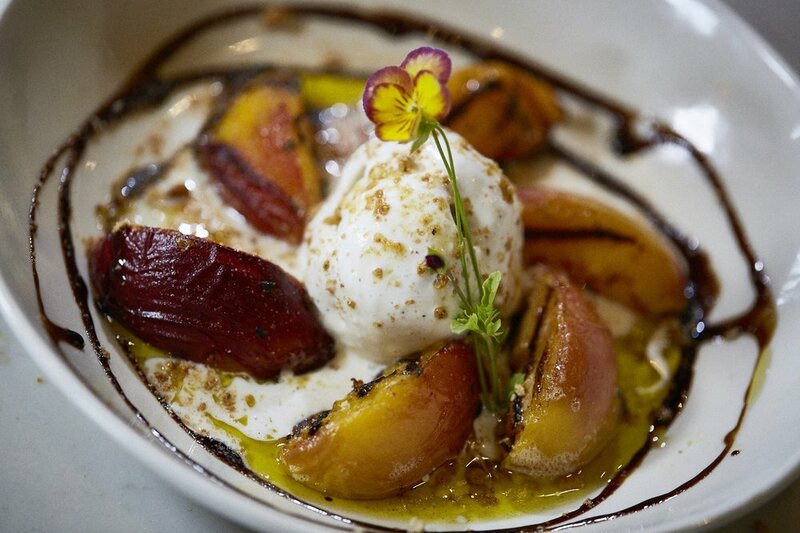 Pour olive oil over the gelato and drizzle the edges of the peaches with balsamic reduction. To finish, crumble Italian cookies over the dessert for an added crunch. As the owner of four award-winning Sedona, Ariz. restaurants and two future restaurants opening later this year, Dahl has spent more than two decades pursuing her grilling passion at each of her restaurants that range in cuisine from classic Italian to upscale South American. A James Beard House-featured chef, Dahl is the largest restaurateur in Sedona, severing nearly 400,000 guests annually across her extraordinary restaurants, Dahl & Di Luca Ristorante Italiano, Cucina Rustica, Pisa Lisa and her newest, most buzzed-about addition, Mariposa Latin Inspired Grill. For more information on Chef Lisa Dahl and Dahl Restaurant Group, visit https://dahlrestaurantgroup.com/. Dahl Restaurant Group: Led by Owner and Executive Chef Lisa Dahl, Dahl Restaurant Group (DRG) welcomes nearly 400,000 guests annually across all four award-winning, Sedona, Ariz. restaurants including Dahl & Di Luca Ristorante Italiano, Cucina Rustica, Pisa Lisa and Mariposa Latin Inspired Grill. As the largest restaurant group in Sedona, DRG employs close to 250 people, many of whom have been with the company for more than 15 years. Each outstanding restaurant continues to garner prestigious, international recognition and ongoing accolades. Chef Dahl and her restaurants have been featured on The Food Network, Travel + Leisure, USA Today, The New York Times, Wine Spectator, Travel Channel, Huffington Post, MSN.com and Marie Claire, to name a few. DRG will open two additional restaurants, Butterfly Burger and a second Pisa Lisa location, in early 2019. For more information, visit DahlRestaurantGroup.com.